Mindray Medical International announces the launch of its advanced solution for cardiology and ECG diagnosis - the BeneHeart R12 electrocardiograph. We conducted numerous Voice of Customer (VOC) surveys to shape the development of the BeneHeart R12 and its innovative features satisfy these user demands brilliantly. On 18th February, via live web seminar, Mindray Medical International launched the new BeneHeart R12 electrocardiograph, its advanced solution for cardiology and ECG diagnosis, to its employees across the world. The R12’s user-friendly and intuitive panel design includes features such as the 8-inch high resolution colour display, soft and hard functional keys, a qwerty keyboard layout and anatomical design. The R12 also has a 216mm A4 and letter size thermal paper printer with a patented, paper tray slide mechanism which makes routine paper loading a breeze. The R12 re-analysis function allows patient information to be entered after taking the ECG automatically adjusting the interpretation to account for age, gender, pathology and therapeutic profile. With a 6.5 second start-up time the R12 is around 5 times quicker than many ECGs on the market. Compact and lightweight (portability is particularly important for ICU/CCU/EICU needs) the R12 also claims impressive storage (an 800 record capacity) and a long battery life which supports 400 reports per battery charge duration. Using the globally recognised Glasgow 12-lead analysis gives the R12 unrivalled diagnostic confidence and accuracy. Diagnosis can be made in adults and children from birth upwards and the V4R (C4R) electrode placement is ideal for paediatric patients. The R12 Critical Values feature highlights warning traces to aid rapid responses to potentially urgent issues like bradycardia, tachycardia, acute ischaemia and myocardial infarction. 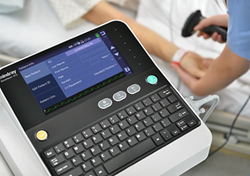 Users highlighted how important connectivity was, so the R12 features many ports via the USB drive, external printing and ECG files can be sent to any wired or wireless ECG data management system, seamlessly linking in with the EMR or HER. As a paperless technology, the R12 is environmentally sound conserving both expensive ECG paper and energy. The preview feature displays an ECG report image on screen which can be sent as a file to an ECG management system with just one click, enabling electronic review of ECGs.